Each week we create a new menu featuring a variety of seasonal options. Orders must be placed by Sunday night. Meals are prepared and delivered every Tuesday. ​Enjoy delicious, healthy, restaurant quality, gourmet meals in the comfort of your own home. All you do is heat and eat! We use only the freshest ingredients available with an emphasis on local, organic sources to provide you with a healthy alternative to fast food. We will be serving hot breakfast sandwiches and coffee as well as grab and go lunch and picnic items Saturday mornings at the Transylvania County Farmers Market. Also, look for select items that will be available Thursday-Saturday at Just Ripe Farmstand ​during the summer season. The perfect solution for any dinner party! We consult with you in advance to personalize the menu. On the day of the event, we prepare the food in our commercial kitchen and deliver everything ready to serve on your favorite platters. ​we are available for teaching demonstrations, in home cooking lessons, private dinners and other special occasions. Customizable gift certificates are perfect for occasions such as baby/wedding showers, birthdays, Mother's/Father's Day, Housewarming, etc. Based in Pisgah Forest, we currently deliver to select areas in Transylvania County. Please feel free to contact us for a free consultation at globalchefservice@yahoo.com or 404-906-3626. Sign up here to begin receiving our Weekly Menus! Tony Carollo's passion for food and ingredients has grown out of his 25 year career as a professional chef. His background encompasses managing restaurant kitchens and staff, planning menus, managing food costs, arranging banquets, and hosting dinner parties and family gatherings. Tony is a confident, experienced chef with strong organizational and improvisational skills. Whatever the cuisine, Tony's respect for the integrity of the ingredients fuels his excitement for creating dishes that nourish the body as well as the soul. He welcomes the opportunity to take the drudgery out of meal planning and turn your mealtimes into something memorable. 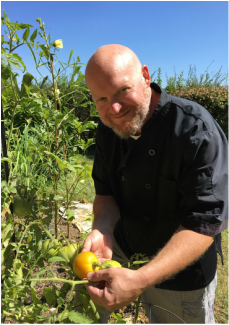 Tony is a current member of the United States Personal Chef Association, is Certified by the National Registry of Food Safety Professionals for proper food safety and handling procedures, and is an active participant in the Appalachian Sustainable Agriculture Project (ASAP).